The new Diavel 1260 combines personality, sportiness and comfort. Strong character. Muscular lines. Top performance. Riding pleasure. The new Hypermotard 950 is the perfect choice both for moving in traffic and having fun outside the city. Hypermotard means maximum fun everywhere. Renewed power. Great handling. The new Hypermotard 950 offers pure fun and adrenaline. The new Hypermotard SP is designed with sleek lines and surfaces: new style, endless fun. The new Monster 797 with renewed graphics is the ideal bike for new Ducatisti. The Monster 797+ features a distinguished look thanks to its standard equipment. The Monster 821 has gone stealth with updated graphics and a new colour scheme. The new Multistrada 950 is versatile whether it’s on urban roads or mountain curves. The new Multistrada 1260 D |Air® offers its rider cutting-edge technological innovation with regard to safety. Exclusive livery inspired by the MotoGP sets the new Panigale V4 S Corse apart from others. The new Panigale V4 R combines personality, sportiness and comfort. 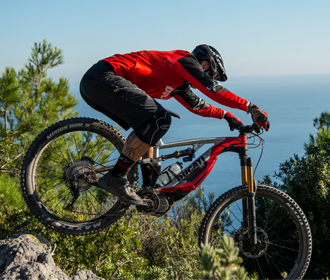 The MIG-RR is the result of a partnership with Thok E-bikes, an Italian company specialised in pedal-assisted bicycles.